The kick-off time of the 2016 Women's Muratti has been changed because of a problem with ferry services. Condor Ferries have cancelled a planned sailing of the Condor Clipper on the evening of Sunday 15 May, meaning supporters could not get back to Guernsey after the match in Jersey. The planned 13:30 BST kick-off has been brought forward to 12:30 BST. It is hoped that will allow Guernsey fans to catch a sailing of the Condor Liberation which sails at 14:45 BST. 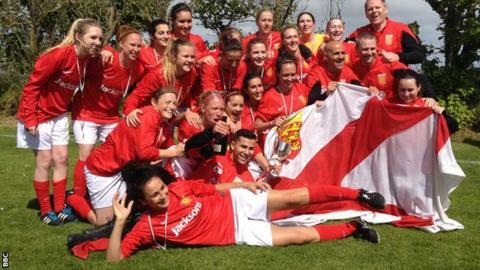 Condor Ferries says the Clipper is undergoing 'important maintenance work' and has agreed to pay for a charter flight to get the Guernsey women's team back to the island after the match. "Whilst we acknowledge the efforts Condor have taken to ensure the women's playing squad can return to Guernsey on Sunday, we were conscious that this did not take into consideration the Guernsey supporters looking to attend the match.," said Guernsey FA (GFA) chief executive Gary Roberts. "As such, the GFA approached the Jersey FA with a request to change the kick-off time and we are delighted that the request has been accommodated, which will enable Guernsey's supporters to watch the match." Condor Ferries has come in for widespread criticism since the Liberation was brought onto the UK-Channel Islands routes at the start of last year. It has been beset by mechanical problems leading to delays and a promise from the company's new chief executive earlier this month that the firm would "regain public trust". "It is yet another example of the wide-scale travel issues that continue to negatively impact on inter-island sport," added Roberts. "Flight and ferry timetabling, increasing costs and availability issues, are all impacting on not only football but every sport that has inter-island competitions. "Until such time as this matter is given the recognition and concern it both demands and deserves by the relevant senior political, sporting and travel representatives, the situation will only continue to deteriorate."